Pour out any excess soaking water from the oats, otherwise your porridge might get a bit watery with the amounts described above. Put the oats, the water, the salt and about half of the milk into a non-stick pan and bring it to a boil, then lower the heat to a simmer. Add more milk depending on the texture you want the porridge to have, some like it thicker, other's smoother. After about 20 min or when you're porridge is about the right consistency for you, take the porridge off the heat and leave it to rest for 2-3min, which allows it to fill out and get just a little bit creamier. Then to the special ingredients that make this such a to-die-for great porridge. The better the whiskey and honey, the more luxurious the taste. 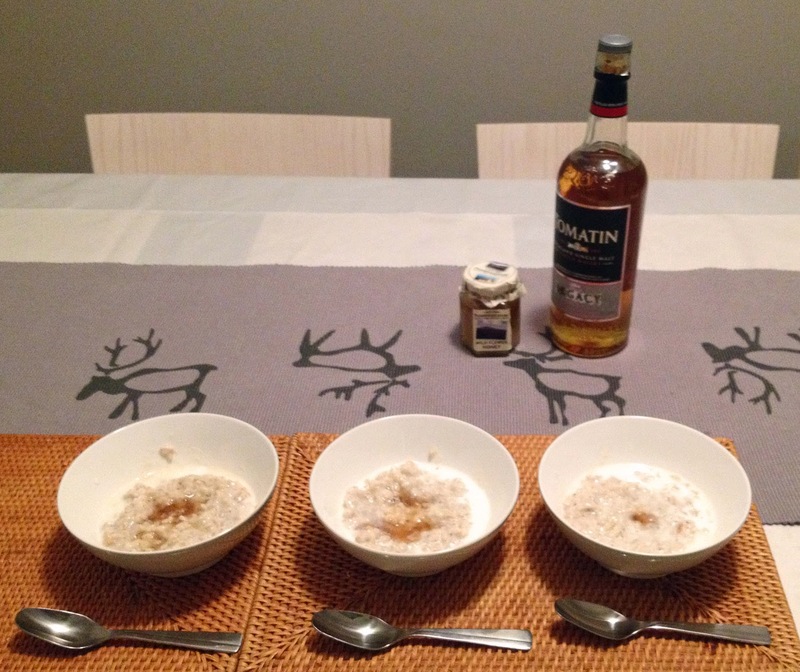 Finding a good combination of whiskey and honey can turn into a lifetime project, moving to ever more wonderful and exciting palatal experiences, but for starters I would recommend a good honey in liquid form and a whiskey that isn't peaty (but preferrably Scottish - it's the Scotsman, after all, not the Canadian Club porridge..). Using very expensive whiskey is a bit of a waste, since the honey gives the whiskey a smoothness that whiskies otherwise aquire with aging. I used Tomatin Legacy, a surprisingly good easy-drinking, affordable whiskey, and some wild flower honey from Wales that was a gift from my mother-in-law (thank you Sue!). So, this time I had some great stuff, but really, you can probably do just as well with whatever honey you have lying around and whichever miniature bottle of whiskey you can find in you're local liquor store. The cream is just ordinary double cream. So, once the porridge has rested just ladle out the portions onto deep plates or into soup-bowls. Spoon over some cream, honey and a splash of whiskey and you're ready to go. Amounts are completely according to taste, and you can mix it all in or leave the "spices" more separate. My winning combination is something along the lines of 2 tbsp of cream, 1tsp of honey and 1 tbsp of whiskey.